I’ve discovered that the biggest barrier to the second book is the first one. Saxon’s Bane started in hubris, that ‘of course I can write a book’ arrogance that had me scribbling away, blissfully unaware of how much I had to learn. Six years ago, IT – the proto-book, this literary spermatozoa – bore no relationship to the end result. IT started in hubris, and finished through bloody-mindedness, a stubborn refusal to succumb to the cycle of rejection, rewrite, rejection, rewrite. Plus, of course, the oh-so-necessary criticism and help along the way that taught me the basics of the writing craft, and ultimately led to Saxon’s Bane, an agent and a publishing deal. Good result. Fabulous. Then there’s just a blank page and another writing mountain to climb, but this time, there’s a difference. Now I know what ‘good’ looks like, and no first draft is good. So there’s my first lesson; learning to write on, in the uncomfortable knowledge that I’m leaving imperfection in my wake. Goodness may come with the third, or fourth, or fifth, or ‘n’th draft, but it is only there in embryonic form in the first. The second lesson was an amicable divorce. Not, I hasten to add, the marital kind. Mission Control will still be giving in-course guidance. But in creating Saxon’s Bane I had created a world that could only be real to a reader if it was real in my head, with characters that existed so powerfully that they danced from page to page. Their pain was my pain, their joy my joy. Walking away from them to create a different world is like severing ties with good friends, friends who still call me, when my mental guard is down, to remind me of the good and bad times we have shared. The solution, I’ve found, is a road map, something to help me look forward rather than back. Fifty thousand words into the next book, a new world is taking shape. I’m starting to know a new set of characters, and I’m making friends – and enemies. They’ve become real enough for me to take a three week writing pause in which I created something very close to an outsized submission pack: character profiles, a synopsis, and four thousand words of chapter plans. I like it. I really like it. I’ve even became fired with my own vision. This is gonna be good. Has anyone ever noticed how evocative music can be? The way it takes the mind back to a particular time and place? I was at an elderly relative’s house recently. Someone had been helping her clear out old cupboards. Rescued from the debris was a stack of old piano music, some of it still inscribed with the names of people who were born when Queen Victoria ruled an empire. Slices of social history from an era before television, when a family made its own entertainment around the piano, or the ‘ol joanna’ as one London great-aunt used to call it. Some sheets evoked an image of elegant couples dancing foxtrots or waltzes to the sound of big bands with massed saxophones. The words shone a spotlight on an era that is passing from memory. An image of innocence formed in my mind; young lovers in a past so distant that unmarried cohabitation was unthinkable. 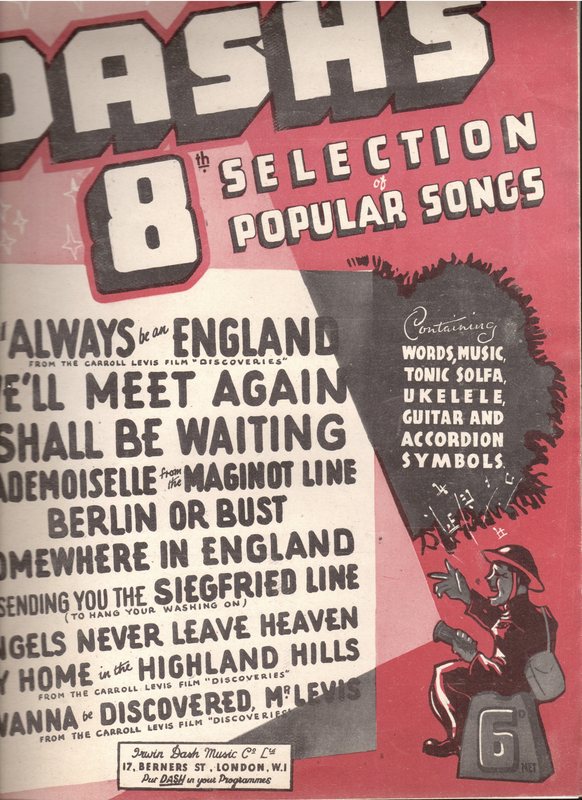 Then one thin, folded compilation caught my eye; on the cover a cartoon showed a British soldier sitting on an ammunition box, tin hat at a rakish angle, waving a torch as he apparently sang along with the music inside. Copyright 1940. At least, I think that’s what MDCCCCXL means. Certainly, the songs were of the era when courage and defiance seemed to be the watermark of the British soul. No one will ever pay me to play a piano. In fact, when music I’ve never tried is being passed around, people learn only to ask me once. A tight, polite smile stretches over the listeners’ faces, cracked by the odd wince as I massacre another chord. But hey, ho, this stuff was too good leave unplayed, so I propped it on the piano and started. Have you ever felt that an audience was with you? I mean, totally with you, carrying you, urging you on? Around me, querulous, reedy voices found a power they hadn’t felt since before the old King died. Their enthusiasm filled me with confidence. I even started playing better. Well, at least the noise drowned the mistakes. More! More! We were on a roll. A ninety-two year old clapped her hands over her head before her voice faltered at the memory of the dashing young Major she’d married in 1943. I turned as the singing faded into sniffs behind me, and in the dewy eyes of the older generation, I saw the ones they’ll meet again, some sunny day. You can have too much of a good thing. Now where did I put that Flanders and Swann album?